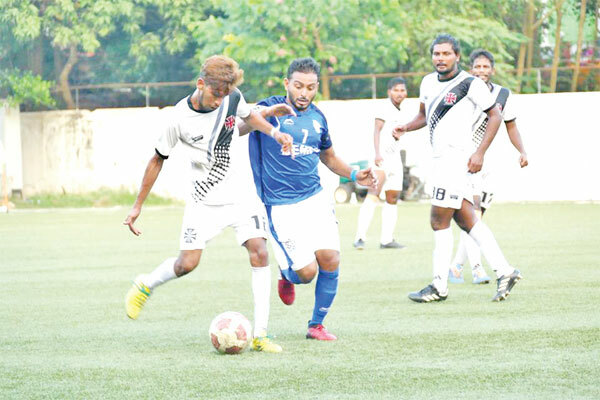 MAPUSA: Dempo Sports Club continued their upward spiral in the league table with an impressive 2-0 win over Vasco Sports Club in the ninth round match of the Goa Professional League organised by GFA played, at Duler Stadium, here, on Wednesday. After Wednesday's match, Dempo moved to 17 points while Vasco remain stranded on eighth place with 10 points. Dempo knowing a win would exert pressure on table toppers Goan FC scored both their goals in the second session through Jessel Carneiro and Beevan D'Mello. The Golden Eagles enjoyed better possession than their opponents but could not make it count with strikes from U-20 Floyd Pereira and Jaison Vaz sailing over the crossbar without troubling the Vasco keeper. In the 39th minute, Vasco’s medio Anil Gaonkar ghosted inside the goal area but after doing all the hard-work he shot tamely into the hands of the Dempo keeper Tyson Caiado. Dempo nearly got the breakthrough goal in the injury time but Jaison, Joaquim and Edwin just could not get a touch to a goal-bound free-kick taken by Kirtikesh Gadekar and the ball was cleared for a corner by Anil Gaonkar. Dempo kept probing and went very close when Velito Cruz’s shot and substitute Suraj Hadkonkar's header were just inches wide from the target. It needed something special to break the deadlock which came in the 75th minute of the second half when Jessel Carneiro put his laces on the ball to smash it into the net from a long pass by Velito leaving no chance to Vasco keeper Sanju Thappa. Vasco keeper Sanju Thappa brought up a smart stop in the closing minutes to deny Kirtikesh’s firm grounder in finding the net for Dempo.